I've been reviewing a few indie books lately. So far, they've all gotten four to five stars from me. Am I being easy on these writers, sympathizing with their independent ventures? Hell no. Of all the indie books I've read thus far, none have let me down. I'm sure that there is crap out there, crap meaning unedited writing that should is not, and perhaps never was ready for publishing, of which was the fear for small and/or self-published press before eBooks exploded onto the scene. The latest one I've read is That Which Should Not Be, by Brett J. Talley. Let me tell you, this book is a brilliant mix of not just the Cthulhu Mythos, but many other myths and legends, religions and cults. While reading, I thought of Talley's book as an onion. You keep peeling back layers and layers of detailed, rich stories that's both fascinating and frightening. Yet the onion is one whole story. 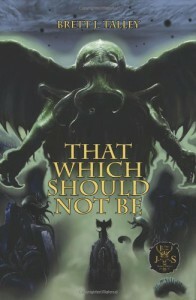 Talley obviously has a strong grasp upon the things he writes about, with the Cthulhu Mythos taking center stage, and it was a lot of fun to pick out all the Lovecraftian references, such as a boat named "Kadath". We start the story with Carter (another reference), who is studying at Miskatonic University, of course. One of his professors has an important job for him. He must travel to an old port town called Anchorhead to retrieve a book called The Witch's Fire. This book, like the Necronomicon, is a dangerous tome, to be handled only by the most experienced of sorcerer. This leads Carter into an adventure where he is told tales of wonder and violent death at the hands of the Wengido, a cult, and an alternate universe on the sea. Each story brings us closer to the main story, and when it all comes together, it's like an explosion of tentacles and black, leathery wings. If you enjoy the old classics by authors like Lovecraft and Blackwood, you will have no problem sinking into this one. It is, in the end, a terribly fun ride.